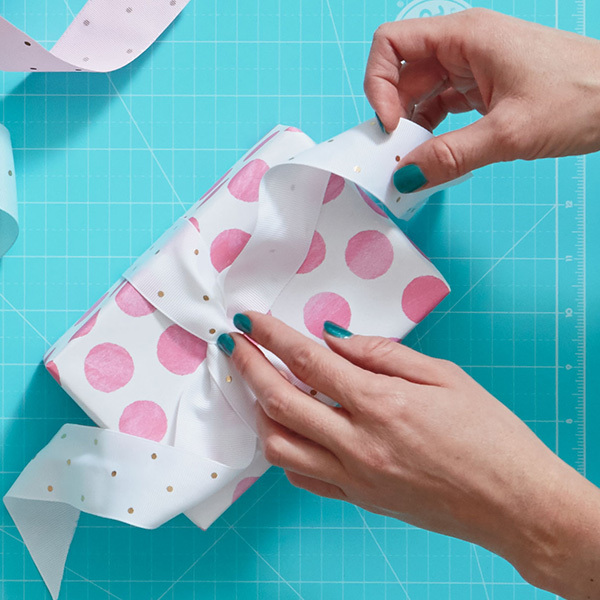 Gift wrap style quiz: What kind of wrapper are you? Extensive and super-scientific Hallmark research indicates that people who wrap presents fall into specific, well-documented categories. Knowing your type can be helpful in your gift-giving experiences. To help you identify your gift wrap style, please keep track of your answers and compare them to the results below. Note: The research is super-scientific. This quiz is… not. A. Fabulous and beautifully accessorized. B. A perfect expression of creativity and personality. D. As long as everything is covered up, we’re good, right? A. Well-stocked gift-wrap aisles, party and card specialty stores, and adorable boutiques. B. Craft stores, card and paper shops, and thrift or vintage stores. C. From people thoughtful enough to open their presents without tearing the paper. D. Um…in the same place I stop on the way to the party to get the gift. A. Wedding and baby shower gifts. I love making sure they stand out on the gift table. B. Simple gifts with stories behind them. I turn opening the present into part of the experience. C. The ones that fit in bags. Fluff some tissue paper and done. D. The ones that come with a bow already on top. A. At a dining room table piled high with coordinating paper, ribbons, bows, and attachments. B. In my craft room, surrounded by stacks of kraft paper and art supplies. C. Digging through my stash for occasion-appropriate wrap and not-too-wrinkled tissue paper. D. In the car, peeling the stickers off a just-purchased gift bag. A. Presentation is everything: It’s the way you make a great first impression with your gift! B. Gift wrap is the pre-show. It should be fun and get someone excited about opening their present. C. Wrapping is a necessary part of the gift—it’s there to protect the present or the surprise. D. I’m supposed to have a philosophy about gift wrap? B. Everywhere. Art is all around us. C. The size of the gift, the wrap I have handy, and the time I have until the party. D. An overwhelming sense of urgency and panic. Total the number of answers you had for each letter, and find your gift wrap style below. Please note that many people exhibit traits of more than one style, depending on the occasion, recipient, and other contextual cues. It is not unusual to present with more than one gift wrap style. For you, finding just the right present is only part of the fun. You get giddy about coordinating your wrap with the bride’s colors, the baby shower theme, the birthday kiddo’s favorite super hero, or the hostess’s kitchen décor. You can do totally tasteful or all the way over the top—or anything in between—depending on the occasion. You may or may not have a selection of different kinds of tape to use on different types of paper. Definitely check out the Hallmark Signature gift wrap collection. From playful to fancy and super-cute to totally luxe, this selection of wrapping paper, gift bags, and accessories was made with you in mind. Our Giftology series is full of tips and tricks, like how to build a gift tower and add a sash to a gift. When it comes to gift giving, you always think outside the box. Maybe you’ll decorate your own paper. Or DIY some tassels or pom poms. Or incorporate a little add-on gift into the wrap. Or you might create a complex, clue-filled quest to build excitement for the lucky recipient. Whether you go trendy and minimalist or decorated to the max, wrapping presents is one big happy creative exercise for you. Collections like Eclectic Kraft and Bright & Modern were created by designers and artists like you. They’re full of complementary colors and textures, so they go together without being matchy-matchy. Want DIY ideas? See how to make a tassel or flowers from tissue paper to decorate a present. Your gift closet is as well-equipped as any wrapping paper section in a store, and it’s the first place you “shop” when there’s a party. Your senses tingle when there’s a stock-up sale. And there’s no shame in your re-gift-bagging game. But that doesn’t mean you’re less thoughtful—in fact, you’re a very generous gift giver. And your practical approach means you’ve always got the right wrap on hand for any present and every occasion. You are the reason we put cut lines on our paper, make reversible wrap, and created wrapping paper pads. Check out tips and tricks for organizing your closet gift wrap stash and solutions to 6 common gift-wrapping dilemmas. You’re a kind, thoughtful friend. You know your mom’s favorite perfume, the artist your sister likes, and your best friend’s preferred adult beverage. But you’ve got a lot going on. This thing about getting a gift and making it fancy? What are you, an elf? It’s not that you’re against wrapping presents—you’ve just got too many thumbs and too little time. When it’s important to make something look like an intentional, pre-planned gift, there are easy solutions. Try sticking on some curly ribbon, or adding a gift tag or tassel. We’ve got your back with basics tips, like how to put tissue in a bag and wrap a present without tape, because who has that kind of thing just lying around?